16 beautiful heartwarming love stories which will keep u hooked till the end..
1. Jitender Rishi Parmar : his story is simple , yet you can connect to it . The language is easy and overall defining term is sweet..
And the best part is the editing stuff of all the stories , which the author has done so beautifully..
3. 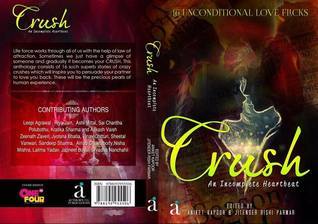 Ashi mittal : ashi impresses with her writing . The story kindles the hidden romance in you making you believe in love at first sight..
4. Japneet Boyal : the author effortlessly narrates a cross culture love story . The ending is sad but true . All in all it accounts for sweet love story that depicts the current situation of love. 5. Arnab chakraborty : the story starts well but it's uncertain ending and loose plot proves harmful to it . It could have been better . 6. Akash vaish and kritika sharma : the story is emotional and wisely written . It has a perfect jist of a love story . The story will keep you hooked and probably will make you say 'awww' . 7. Jyotsna bhatia : a perfect teenage love story . You will find it cute and the beautiful description of first love will leave you spellbound. 8. Lalima Yadav : the story is more than just beautifull . It will probably make you cry. The sacrifices are so effortlessly narrated in the story . The language is easy and it depicts how blind trust can be fatal..
9. Zeenath Zaveri : revenge , love , innocence and trust all combine to give this beautiful love story which is so eternal in its content . It will at a stage redefine the importance of love in one's life..
10. Shraddha Nanchahil : an improper ending prove fatal for the story. The story could have been better , it was a fresh and good idea , overall..
11. Leepi Agrawal : the story is heart touching but lacks practicality..otherwise it was a good love story that gives another definition of true love . 12. Nisha mishra : the story doesn't keeps you hooked . The story raises hope of a good ending , but contrary to that there is no proper end..it could have been better..
13. Sandeep Sharma : the story is a way good blend of love ,betrayal and love at first sight. The story is sombre and all in all a good one..
14. Vinay Chitturi : romance , humour , college life all make the story a perfect one .the ending will leave you smiling . The language is simple and makes it a good read..
15. Sheetal vanwari : the starting is good . The narration of love at first sight is better . Emotions gives the story a real touch . All in all it is a simple and cute story..
16. Sai charitha polubothu : the author presents crush incomplete love in a commendable manner . The ending is heart touching . All in all a good read..